This is a Guest Post by Leonhard Widrich, who is the developer of BufferApp, a tool which lets you to tweet effectively. Overtime, I realized the importance of Twitter & how much it contributes as a Social site. This quote by Mani from one of his recent blog posts is a spot-on thought about how our user patterns on twitter are always changing. One can also only agree to an increased seriousness we nowadays find on twitter. The picture of a procrastination tool we waste our time with is certainly no longer a current one. In order for us to make the most of twitter, everyone has developed ways and techniques that work best. 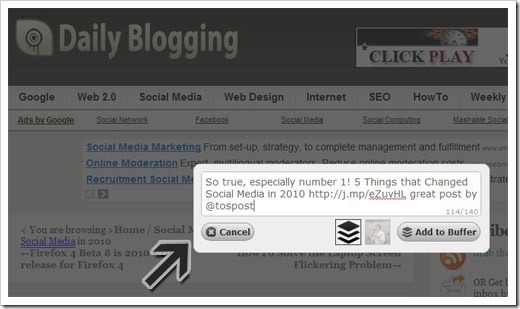 I want to share a few thoughts on how I achieve higher engagement and clicks on my links on Twitter. Hopefully you find them useful. When we use various, simple twitter features such as ReTweets, @mentions or #FF it is very easy to fall into the trap of doing what everyone else does. Simply clicking the ReTweet – button or sending a #FF tweet with loads of names in it does not provide much value for followers. Therefore I prefer to make RT’s personal, by adding why I ReTweeted this tweet. Also, don’t mass follow- Friday, simply because you feel you have to. I try to think carefully and then only give credit to one, two or at most 3 people alongside explaining why I suggest them to be followed to your followers. If I have more than one #FF to give out, I split them up in several tweet. Additionally, whenever you find yourself tweeting an interesting article, don’t just tweet the title with the link. Explain, why you think this is worth reading by adding a quote from the post or a short summary. And finally, which is particularly overlooked by many, add the author’s name at the end. Give them credit and let them know you liked their post. You will be surprised which effect doing so has. Following the advice from the above lines you might find yourself quickly spending a lot of time on twitter during the day. If you don’t want to commit to that, I want to introduce Buffer to you, a new tool which intuitively helps you to tweet smarter and in a less time-consuming way. 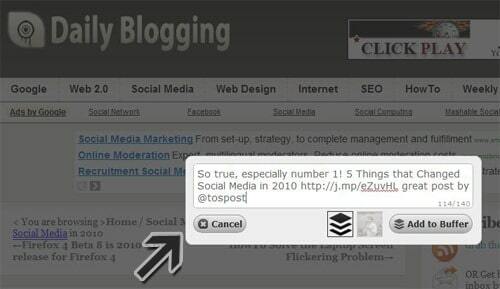 Whenever you come across an interesting article, a quote or other shareable content you can now add it to your Buffer. This makes sure that instead of posting tweets immediately to twitter, they are evenly spread out over the course of the day. Many people have maximized efficiency using Buffer by filling up their Buffer with tweets every morning they check the news and browse their RSS reader. This helps them to share genuine content without any additional effort to their daily routine. Just click the Buffer Icon and add to your Buffer, whenever you like something. That’s it. Since you are then tweeting evenly spread out over the day, people will engage with you more often and therefore you can really focus on the interaction. You can also checkout the other Top 5 Social Media apps which will help you to keep an Eye on Social Media. You can also Subscribe to Our RSS Feeds / Daily Updates if you don’t want to miss interesting guest posts like this one. Let me know which techniques you have to keep up with the “latest” twitter. Hi Leonhard, I saw another guest post from you on Daniel’s blog and I’m really sold on checking out Buffer now. The Chrome extension is pretty sweet too. I’ll test them out and give you some feedback soon. Thanks! Leo, I’m comparing Buffer to Timely and I’m allowed to add many Twitter accounts on the free version of Timely and only one with Buffer. Any plans on changing that soon? Yes you are right, there are quite a few similarities with Timely and Buffer. In general, I feel that timely is quite a bit different. With Buffer you are given the control of setting the times yourself. Also the “analytics” feature that Timely has, which they argue to be the ace up their sleeves deserves a second look. I know I am biased here but my arguing is still logical. The problem is this: Timely’s tweets are based only on your own tweets, not based on your followers’ tweets. i.e. if you only ever tweet between 9am and 10am they will recommend that you tweet between 9am and 10am. We are working on our own algorithm and want to get it right. However we are currently reviewing whether the whole issue of analytics, which is very effective to market a product, also has a real effect to it. The general issue of “when to tweet” is not so different for every individual twitter user. It might make sense just to have a general recommendation saying “those are the times for maximum engagement” instead of falling for a “we analysed your tweets for you” since the real value of that is questionable. Leo, that’s exactly what I’m testing to find out. I’ve followed several posts from social media Guru Dan Zarrella and he has done tons of experiments about the best time of the day to tweet and to publish blog posts. He even has statistics on the most frequently retweeted words! His book is called the Science of social media. However, I have serious doubts that any of it means anything. And the problem is just as you stated – if 3pm is a good time for me to tweet – whose 3pm are you talking about? My 3pm is different from yours, and my friend Andy Bailey over in the UK and also different from Mani – we all have a different 3pm. So how can any algorithm determine what time is best? However, what I do like about Timely (that’s not present in Buffer) is that it tells you which posts were retweeted and how many times. That’s great but I’d also like to know exactly who retweeted me and when. Right now I have to use another tool for that (an extension for Chrome called The Tweet Button). I really need a tool that gives me everything together on one easy to navigate dashboard. Thanks for the conversation Leo. I hope to chat with you more about this. Let me know if you’re familiar with Zarrella and what you think of his research. Very true ankur. I think it just turned into a habit for many and they don’t realise how little effect it actually has! Leonhard Widrich, thanks for the post, its a nice share buddy. Hi Anish, great you like it! You can always hit me up for questions about Buffer if you wish :). Wow, Buffer looks really great. I will check it out for sure! These are some really good tips that you have provided. Thanks for the share, Hope it works out for me. I’ll try for sure after reading more about it, Its interesting. my suggestion is to then try Buffer, where your tweets are still genuine, instead of some auto-everything tool that sends generated tweets. Good one friend. Buffer – new one to me. Thanks. Buffer is really very useful. I tried it a few days ago and it is great. hi leo, its too good.. Thanks a lot for sharing your worth-full information on here, leo. And, it’s great article. Hello Leonhard Widrich,Thanks for amazing tips for Tweeter..